Your time is a precious commodity. With a heap of tasks on everyone’s plate, good organization is key to training and development success. Here at LearnUpon, we’re big fans of eLearning project management tools. Our teams have used many of these tools, and find them incredibly helpful when working on projects. To help you break through the noise of all the tools available out there, we’ve assembled a list of our favorite project management tools. Have a read and pick the one that best fits your needs. Easily organize and manage – The most ubiquitously known benefit of an eLearning project management tool is that you can effectively negotiate every step of your business’s learning journey. You can strategize and enact everything from buying a learning management system to storyboarding your eLearning courses to designing your images. All the information you and your team needs is in one handy place. Collaborate – A team working harmoniously together is a difficult thing to achieve – no matter what size. A project management tool makes it that little bit easier. You can keep track of everyone’s role, tasks assigned and break bigger teams and plans down into more manageable sizes. Everyone is clear on their job and your projects run smoother. Share resources – Keeping track of team members is difficult enough, but keeping track of the work they do can be impossible! A great project management tool makes it effortless. All of your important documents are stored together, so every team member has easy access. One of the big names in project management, Wrike is a tool that works perfectly for big teams. It has impressive features that enable you and your team to ideate and plan your training strategy from inception to roll-out. You can take advantage of the Gantt chart feature that lets you create a visual timeline, so that your team can track every stage with ease. And you can customize groups, dashboards, and workflows to fit the needs of your team. There are lots of tools to integrate with too – Zapier, Gmail, and Box to name a few. Clean and uncluttered, Asana is one of the most visually appealing project management tools out there today. But it’s not just a pretty face. Asana has plenty to offer that makes it a valuable tool. For task assignment and management, it’s one of the best. It’s remarkably clear to see who’s doing what, so that your team are aware of tasks specifically assigned to them. One we’ve used and frequently chat about, Trello is perhaps the most universal project management tool on the market. Its “drag and drop” functionality makes it effortless to move tasks. A quick click and you can assign a team member to a task. And boards ensure each team or project is streamlined without outside noise. Its pricing model starts with a free option and depending on your needs, you can move to a paid plan – perfect for growing teams. Basecamp is a project management tool for the social learning and development team. It has many of the same features you get with other tools, and a few pleasant differentiators too. There are message boards where your team can chat, invite feedback and overcome roadblocks together. There’s also a chatroom where you can ask questions to the whole team. Additionally, you can post daily questions to your entire team automatically. Whether you ask what task everyone has completed or ideas for future eLearning courses, it opens your team up to discussion. Formerly dapulse, Monday.com is another popular option for planning. It’s remarkably effective for creating to-do lists, improving team communication and status checking. It also offers lots of practical planning management templates for you to grab and use. Employee onboarding, content planning, video production; these are just a few of the choices on offer that are perfect for training teams. One of the best tools for solo eLearning project planners or smaller teams, Evernote is a favorite among many of our team members. If you’re a meticulous list-maker, Evernote is made for you. You can organize all your lists and notes in one place, create checklists, and store all essential files together. These features can also be used across your teams, making collaboration and file-sharing seamless. P.S. Evernote’s screenshot grabbing tool WebClipper is worth a look too! eLearning project management isn’t just about your team juggling tasks, it often involves outside resources too. That’s where Calendly steps in. A simple concept that’s delivered in an incredibly effective way, Calendly is a meeting scheduling tool. It automates your team scheduling so it’s clear who’s available, caps the number of meetings your team can have in one day, and much more. If you’re in the process of demoing a learning management systems (LMS) for your online learning, or buying an authoring tool, meetings about these can be set up without hassle. It integrates with your existing calendars too, such as Google, Outlook and iCloud. Aptly self-described as a ‘central place to access and share files’, Dropbox is one of the original cloud storage tools. And when it comes to file sharing, it’s foolproof to use. If you’re creating eLearning content that you only want certain team members to avail of, it’s great for controlling access. With Dropbox, you know your files and safe, secure and accessible. Working with remote teams and colleagues is a common occurrence in today’s world, and it can have its challenges. Luckily, tools like WeTransfer make it a little easier. With WeTransfer, you can transfer up to 2GB of files for free at a time. You just upload the files and send. It’s perfect for sharing files with colleagues or external people who don’t have access to your shared storage. For example - a topic expert who needs to send a file for one of your courses. For bigger file sharing needs, they offer WeTransfer Plus, a paid plan that lets you transfer 20GB if needed. G Suite is a series of productivity and collaboration tools developed by Google. One of these tools is Google Drive, a cloud storage solution similar to Dropbox. It has skyrocketed in popularity in recent years thanks to its convenience and ease of use. Storing, managing access, and sharing documents is super easy, so you and your team never have to worry about misplacing an eLearning project file again. With G Suite, you can also utilize various other valuable tools, including Docs, Sheets, and Slides. These tools enable you to create and develop content. You can outline your eLearning process, create engaging learning materials, keep track of your training budget… whatever you like! The big draw is that it’s collaborative. Multiple team members can work on your documents so everyone is on the same page. Revisions and updates are all recorded too, so it’s simple to see who’s working on what – a big plus for eLearning project management. Coggle is a simple, yet significant tool for eLearning planners. Used for mind mapping, you can plan, brainstorm, share data, and brain dump information into a cool diagram. All your team can work together on the same mind map and develop your learning ideas in one convenient, visually-pleasing place. Mind maps are downloadable via PDF or PNG, so you can share what you’ve planned with whoever you want. 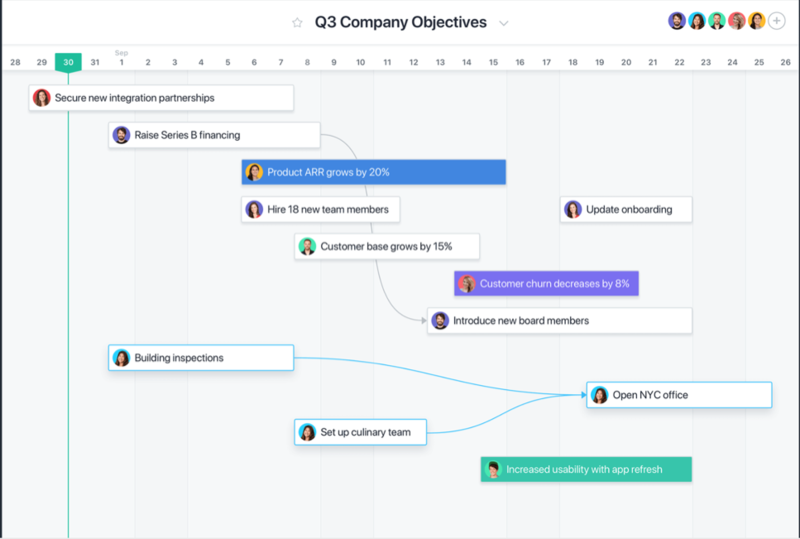 Airtable is a highly useful tool that allows teams to collaborate and organize their work. Part spreadsheet, part database, Airtable is a flexible solution for eLearning teams who want to edit, comment and work together in real time. It works seamlessly on both mobile and desktop, making it ideal for remote teams or out-of-office team members. All changes are instantly synced across devices, ensuring your team are always up to date with the latest project developments. Developed by Atlassian, JIRA is a tool that enables your teams to manage projects the agile way. What makes JIRA unique, is that it goes beyond project management by allowing you to track issues, identify bugs, and plan sprints. JIRA is ideal for organizations who are planning eLearning projects, and need to go beyond the basic level of assigning tasks or prioritizing work. It also facilitates constant feedback and agile reporting that offers actionable insights, ensuring your projects stay on track. If you decide to manage your eLearning projects using Smartsheet, you’ll be in good company. Used by over 50% of the Fortune 500, this tool is multi-functional. With Smartsheet, you can plan, capture, manage, automate, and report on work. Not only does it improve productivity by encouraging collaboration, it increases agility through its real-time visibility. Even better, it allows you to work at scale, so no matter what size the eLearning project, you’re covered. The best tools are the ones that enhance your team and put time back into your day. Test out the ones you think will work for your business. And don’t be afraid to experiment with different tools. It’s sure to help you and your learning and development team work better, smarter and faster. Did we miss your preferred tool? Let us know in the comments below.